Even before he was old enough to lift a racket, 10-year-old Jonathan Greene fell in love with the game of tennis, idolizing world champion Serena Williams most of all. So when Jonathan was diagnosed with a rare autoimmune disease, his family reached out to the tennis superstar in hopes of arranging a phone call to lift the boy’s spirits. But to everyone’s surprise, Serena Williams responded in a much bigger way: She promised to grunt Jonathan’s name every time she hits a tennis ball this year. After hearing Jonathan’s story, Williams announced in a post-match interview that she would honor this brave young fan by grunting “Jonathan!” whenever she strikes a tennis ball. That means not just once every match, or just once every point, but every time her racket makes contact with a ball for the remainder of the season! Jonathan didn’t have to wait long. Williams just put her plan into action at a recent exhibition match, grunting Jonathan’s name on every serve, volley, and groundstroke of her 6-2, 6-0 victory over Germany’s Carina Witthoeft, including a 32-shot baseline exchange that had fans on their feet. At one point, Williams even shouted “Jonathan!” at the line judge to officially challenge a cross-court volley that was mistakenly called wide. Wow. What a world-class gesture. 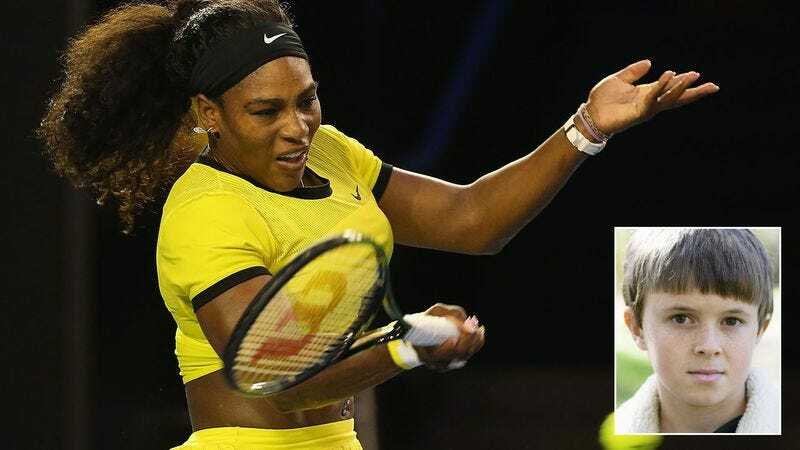 And it’s only just the beginning, as Williams confirmed that she intends to grunt Jonathan’s name on every shot of each of the three remaining Grand Slams of 2016, beginning with the French Open in May. Nothing warms our hearts like seeing celebrities use their influence to do something good. Other players better start taking notes; this is how you give back to a fan in need.